The Track Cycling Academy’s online personal coaching programs are designed to give you ongoing one-on-one support to enable you to stay on track with your cycling and achieve your goals. 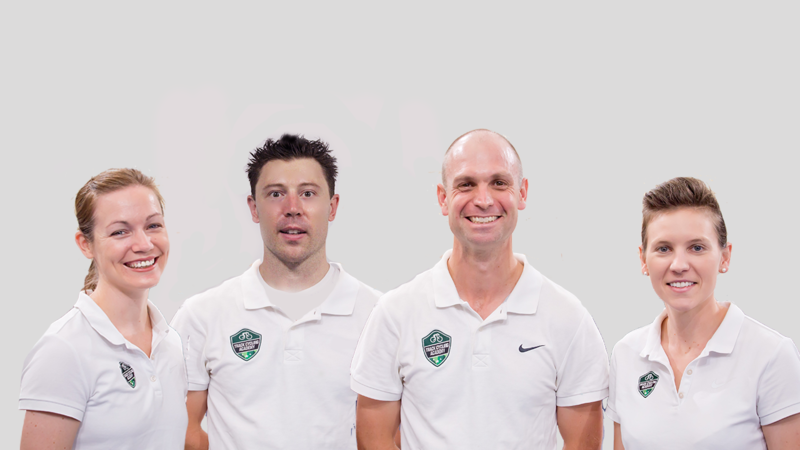 The coaching team at the Track Cycling Academy is a collaborative group who work together to assist our clients from all over the world. Each program is carefully configured and tailored to suit the needs and goals of our clients. 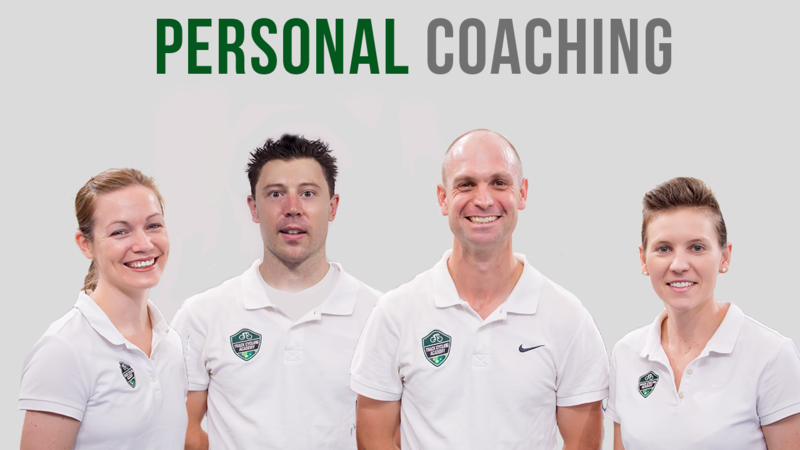 The coaching team is lead by Physiological Performance Analyst Michael Jordan. Michael has an extensive background in elite sport, and is both a former elite athlete and scientist who specialises in performance coaching. Michael coaches current World representative athletes including Former World Champion & Olympic Medallist Shane Perkins. Shane Perkins is a household name in track cycling having represented Australia and winning gold medals at National, Commonwealth and World level whilst travelling to Japan to contest the International Keirin Series - an exclusive invite-only event for the highest achieving cyclists on a global scale. Shane is still competing and working towards his 2020 Tokyo Olympic goal, riding professionally for Russia and representing his trade-team Gazprom. When Shane's not training and competing himself, he takes on a small handful of athletes and helps them achieve their own personal cycling goals, passing on his knowledge and offering highly-sought advice through coaching. Emily Rosemond is a Winter Olympian and represented Australia in Short Track Speed Skating before switching to Track Cycling where she medalled at the Commonwealth Game in Delhi. Upon retirement, Emily started the Track Cycling Academy with Co-Director and former Dual Commonwealth & World Medallist Kerrie Meares. Emily & Kerrie offer support to the worldwide cycling community through coaching clinics and events whilst supporting the Track Cycling Academy coaching team. The Performance program is the next level up from the Express program and in addition to giving you the right support needed to continue with your own training plan, you will receive a monthly Skype chat with Performance Physiologist Michael Jordan. In signing up for this program, a review of your current training, competitive performance, lifestyle, availability, limitations, aims and ambitions is discussed and our team will review your Training Peaks or program in whichever format you're using (spreadsheet, PDF) to ensure it both aligns your goals and expectations and includes the right balance of physiological training elements to succeed. Our coaching team will make adjustments and recommendations each month to keep you on the right track with your cycling goals and speak with you to ensure your questions are answered and you’re getting the support you need. 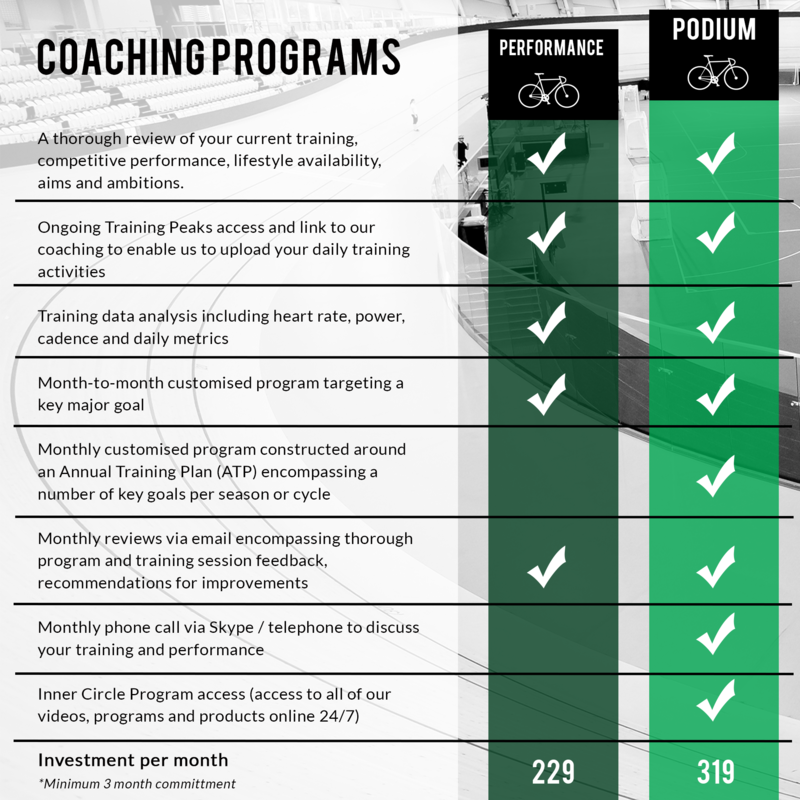 The Podium program is our flagship coaching program where our team will personally coach you to your own cycling success. Whilst the performance program monitors and review your own training plans each month, the podium program is a complete tailored program which is designed and reviewed for you by our expert coaching team. Your coach will be in contact with you every month to discuss your training, make adjustments and provide feedback to ensure that your training is balanced, contains all of the key skills and physiological components to succeed and fits within your lifestyle. Plus, you'll get access to all of our video products by becoming a member of our Inner Circle. This allows you to be part of our closed Facebook group where you can ask questions 24/7 to us, and our growing track cycling community. *All program analysis will commence 7 days following receipt of payment to allow our team adequate time to review your information. The performance coaching program is designed to give you all of the tools and support needed to get the performance edge and achieve your cycling goals. The podium coaching program is a gold medal program which give you access to world class support, program design, feedback, analysis and guidance.